In Division A, Greenlaw came out on top in a nine-goal thriller at Langholm. Playing on the Legion’s new 3G pitch it was William Smillie who sealed the points in the last minute for Greenlaw with his second goal of the game. Other scorers for Greenlaw were T. Hume, L. Hannan and C. Black. Special mention must g to Greenlaw’s Graeme Waddell who played in his first competitive game for over four years after breaking his leg. Tweedmouth made the short trip to local rivals Duns and returned back over the border having plundered the full points. There wasn’t a lot between the sides in the first half. Both defences were on top and it was no surprise when they turned aroundgoalless. In the second half Tweedmouth were awarded a penalty and skipper Clark stepped up and slotted home to put Tweedmouth 1-0 in front. 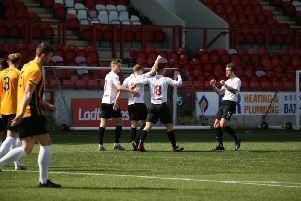 Duns started to push forward searching for an equaliser and they drew level when Luke Turner found the back of the net. Tweedmouth responded immediately. They pressed forward in numbers and their pressure paid off with substitute Wright finding the roof of the net for what proved to be the winner.